Jason Greenhalgh and Paul Smith first met in 1987, both living in and around the Blackbird Leys estate in Oxford, England and brought together through a mutual love of hip-hop and school girls. Greenhalgh was the first into the studio, with "Freestyle Fanatic" launching his career in 1991. However it was the establishment of the Legend imprint and specifically Greenhalgh's "Champion Sound", which really took their profile above and beyond the slew of anonymous white labels that were dominating the music at the time. At the end of 1997, with help from Brilo from Timeless, Greenhalgh and Smith established the CIA label and changed their name to the now synonymous Total Science. The release of their Silent Reign EP for Goldie's Metalheadz breathed a new lease of life into the project, and the pair achieved a further boost with a well-timed Bad Company remix of "Champion Sound" which conjured further interest in what they were doing with their own label. Their debut album Advance exposed a further field of interest, with down-tempo experiments logged as a series of "Breaks" on the majority of their early EP's extended to some superb deep house, this breadth was taken a step further with their Skin Deep imprint which has forged broken beat to considerable acclaim. 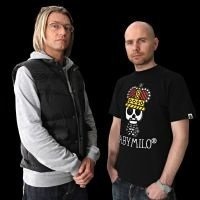 The pair's pioneering of a revival in old-school sounds and arrangements, together with Digital and Reinforced, dominated drum & bass throughout 2001. After this followed releases on high-profile labels such as 31 Records, True Playaz, Reinforced and Soul:r.
2000 saw the founding of CIA's sister label Advanced, created as a means to keep up with the high level of production output from the duo and their confederates, for which one label was no longer enough. Following from this came the renowned Sektor series on Advanced. Initially created as a way of combining up-and coming artists with those more established, the series was also developed as a means to stress the importance more on the music than the artists. Featuring artists such as Baron, Digital, D.kay, Lee, Juju, Beta 2 and Klute, the Sektor series included seminal tracks such as 'Squash", and the ever popular 'Champion Sound" remix. 2003 and Worldwide AcclaimDuring 2003 the pair spent a significant part of the year promoting their music to all parts of the world, touring the USA, Australia, New Zealand, Europe & Brazil. CIA and Advanced became more focused on showcasing other artists and nurturing the profile of then-up-and-coming producers such as Beta 2, Zero Tolerance, Friction, Mathematics and Baron-whose remix of Total Science's Nosher became one of the year's biggest dancefloor stormers, pioneering the jump-up resurgence of 2003. With a new found musical focus- marked by a new studio setup, 2004 was used to up the output quality alongside re-launching their dormant hip-hop/soul imprint - Skin Deep. In true Total Science fashion of never binding oneself to one particular musical form, they released tracks on Creative Source, Defunked and Metalheadz alongside pushing a string of lucrative 12"s on their own labels: Advanced & C.I.A, of which 'No 1.Sound' on C.I.A and 'Defcon 69' on Metalheadz achieved anthem status. The year was cataclysmic for this pioneering production outfit. After one year of a new studio setup they were back on top, producing world-class music that was desired by everyone. C.I.A and Advanced witnessed the release of an array of tracks from talented producers such as Juju's 'Mojohand/Nomad', Calibre & Zero Tolerance's 'Diamonds and Pearls' and State of Mind's 'State of Mind Experience:Chapter ½. Meanwhile Q-Project's 'Ask Not' and Total Science's 'Greatest Thing' stormed their way through the UK dance charts. Later on in the year, Q-Project signed 'Bang Out', 'Uprising VIP' and 'In for a Penny, In for a Pound' to Creative Source, Liquid V and Bingo. Along with the news that Q-project was to sign to Hospital Records, it marked the start of some interesting solo projects, illustrated in the popular 'Hello My name is Q-Project' EP release. The action and buzz surrounding Q-Project and Total Science collectively during 2005 put them in serious demand from promoters worldwide, obtaining them a long list of gigs all over England and Europe, not forgetting to mention the scoring of a prime-time New Years Eve set in New Zealand and a U.S.A tour lasting three weeks. 'Mars Needs Total Science', the much anticipated third album, was released mid 2006 and saw instant success with album single 'Never Had a Dream' reaching Number 1 in the UK Dance charts and a host of tracks from it being played by the likes of Hype, Fabio, Goldie, Zane Lowe, Ronnie herel and Trevor Nelson. Q-Project finally finished his execllent debut solo LP 'Renassance Man" which was released on Hospital in late Autumn. Total Science teamed up in 2007 with DJ Marky's label Innerground to form 'CINNA" The last release '2nd Date" featured vocals from Ayah and was a hot favourite, doing the rounds of the D&B circuit and becoming a favourite of superstar House DJ: Pete Tong!! Mid 2007, Total Science collaborated with fellow Brazilian wonderboy: Bungle on a track entitled 'Snake Eyes". This was one of many popular tracks that featured on Bungle's debut CIA LP: 'Down to Earth. Total Science kicked off 2010 with a bang with singles Testimony and Redlines receiving major airplay and top reviews from the industry and fans alike. They collaborated with Brazilian wonderkid S.P.Y and signed 'Gangsta/Above The Clouds' to Shogun and Audio, 'Legion/Ploc Monster' to Metalheadz. They finished the year with 'Redlines (Break Remix)/ Scaremonger' coming out on Critical and receiving a lot of love from radio and the club djs. 2011- Start as they mean to go on! This year starts of with the release of there first Subtitles 12" Venus Prime [ with S.P.Y ] /Narrow Margin [ with S.P.Y & Lenzman ] and an EP for CIA Ghostrider/Magic Hour/Street Sweeper/Past Lives [ ft Kevin King ] which are all collabs with S.P.Y . They also had there first sample pack which dropped in February, a large selection of sounds & beats from the TS vault which is came out thru Hospital/Loopmasters. The plan for the rest of the year is to go in hard in the studio and hopefully finish an LP by the end of the year as well as 12"s for the usual Key players .